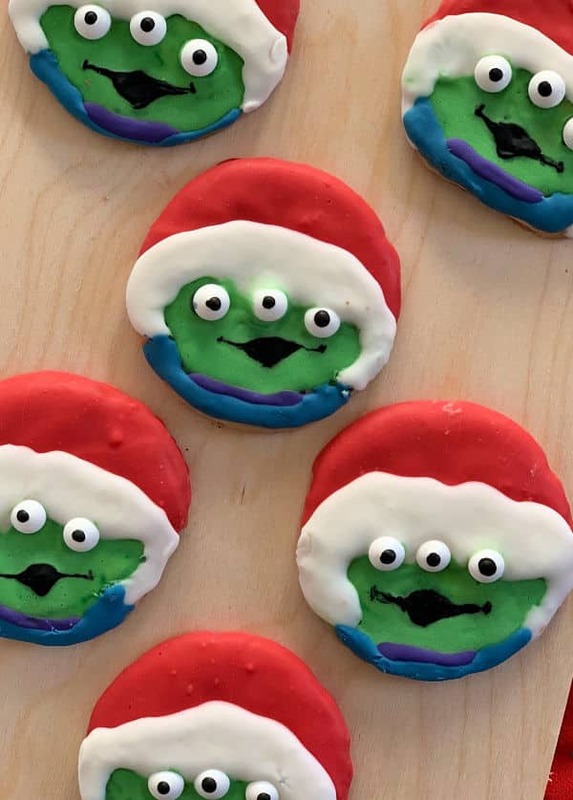 Celebrate the season with these fun and festive Toy Story Christmas cookies decorated with royal icing. Our little Santa Alien already brought us a teaser trailer for Toy Story 4, maybe he will bring us a full one for Christmas! Dream big y’all. The Toy Story franchise really is the gift that keeps on giving. Not only are the movies a huge success in every way, the toys themselves have been a part of real life childhoods all over the world. This year, with the addition of Toy Story Land at the Walt Disney World Resort and next year’s release of Toy Story 4, we just can’t quit these guys. 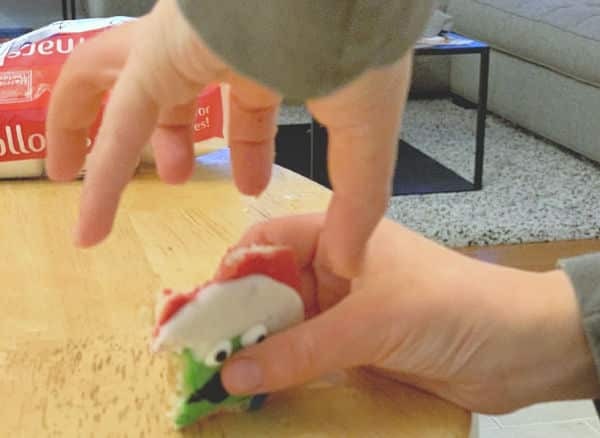 We love our Toy Story crafts like this DIY Mr. 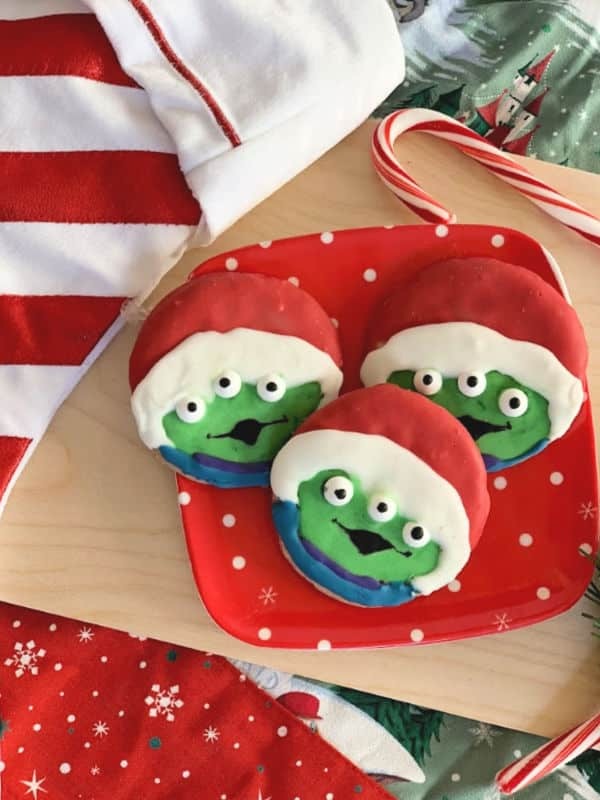 Potato Heat Play Mat or our Toy Story Disney family shirts, so this time I got in the Christmas spirit by making some cute little Toy Story Christmas cookies and you can too! And now that we have a couple new teaser trailers for Toy Story 4, I’m more excited than ever! Y’all know I love to play with my food. It’s so fun to try and come up with new ideas and see if I can execute them. I’m not the best crafter or cookie decorator but I sure do enjoy it! 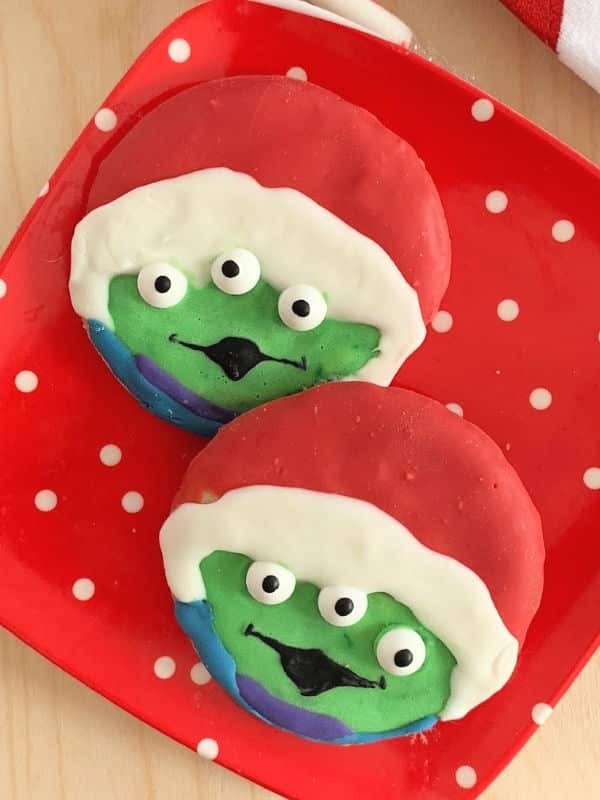 To make my Santa Alien Toy Story Christmas cookies, I used store bought cookie dough and royal icing. I used gel food coloring and a few other tools and got to work! My kids loved them and I had a great time. Win win. If you want to know exactly what I used to make my Toy Story Christmas Cookies, I made you a list of supplies. I bought everything at either the grocery store or Michael’s but you can also order a lot of it online. My affiliate links are below (which means I may earn money on purchases made). I decided to use the ready to bake sugar cookies because I wanted even/circular cookies. Sure I could make the dough and roll it out like a professional, but this was a project just for fun so why take the time? For the cookies, I rolled each piece into a ball and then covered it with wax paper. Then I used a glass tumbler to press the cookie into a flat circle. Easy! Once the cookies baked I let cool before decorating with the royal icing. Royal icing is super fun to use but it can be tricky. As I’m sure you can tell, I’m still working on my skills over here. There are two main things to watch out for when using royal icing. One, consistency. If it’s too fluid it will run all over the place. If it’s too dry, it’s hard to work with. 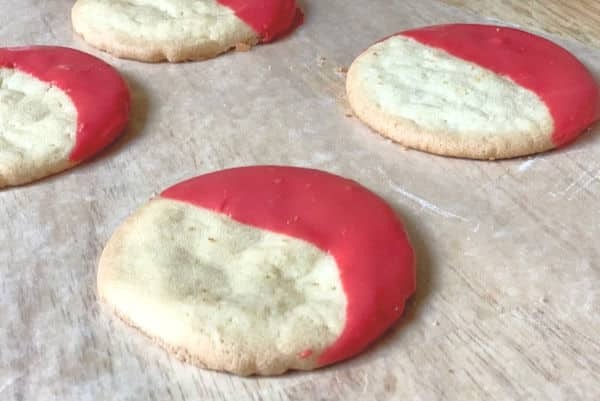 Start with a thick consistency to create a border around the cookie and then fill in with a more fluid icing. Secondly, your icing can dry out if you aren’t careful. I recommend working with one color at a time or at least keeping the pastry bags sealed so your icing doesn’t dry out. I decorated with one color at a time to make sure I didn’t lose my icing. 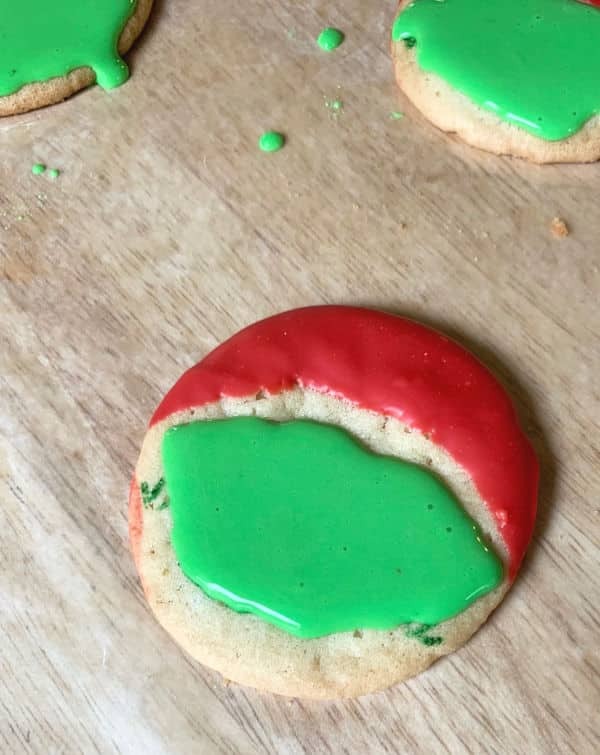 For my Santa Aliens, I started by dipping the top half of the cookies in melted red candy. This wasn’t an exact science as I knew I would be covering the edge with white icing. Once this layer dried, I piped on the green icing for the face in a football shape and let dry almost completely. 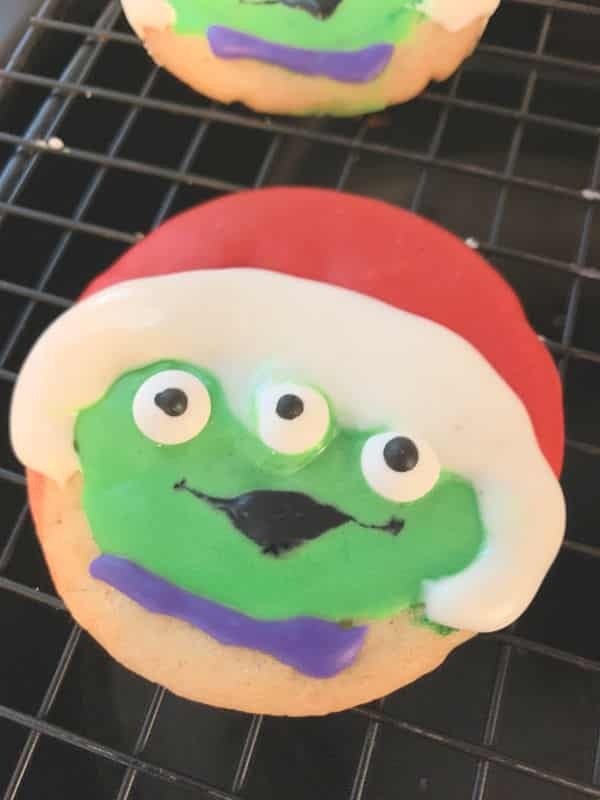 Before totally dry, I added the candy eyes so they would set into the icing. Then I piped on the white “fur” around the Santa hat and let dry. Notice that we are drying between each color. This is important as they will bleed together. Finally I added the blue and purple collar and a small mouth. You can almost hear the little guys saying ooooh, we have been chosen, as you reach down to pick them up. So fun! While we wait for those cookies to dry, how about a couple fun teaser trailers? We’re always chomping at the bit for Toy Story 4 news and I can’t wait to learn more about the newest “toy”, Forky! And if that wasn’t enough, Carnival toys Ducky and Bunny are all of us talking about how much we can’t wait for the new movie. This trailer had me rolling and I can only hope we see more of this pair (voiced by Keegan-Michael Key and Jordan Peele) in the new movie! We can’t wait for Toy Story 4! 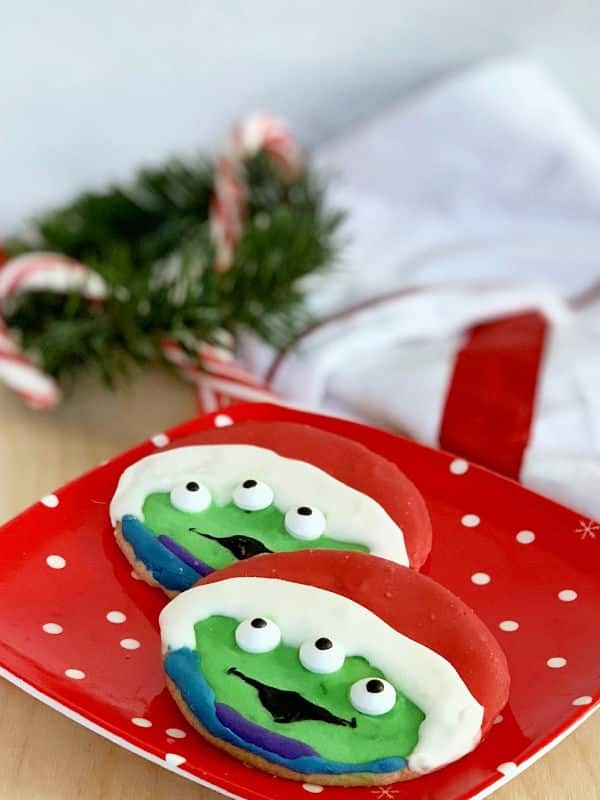 In the meantime, these Santa Alien cookies sure are sweet. Want more Christmas treats for kids? I’ve got you covered. Keep up with Toy Story news on YouTube, Instagram, Facebook and Twitter for the latest.